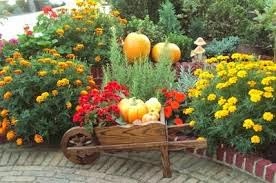 Winter is a couple months away but there is still time for fall gardening. Some of the things you do now can have year-long benefits. Think about getting to work on your garden before you have to think about getting out the snow shovel. Check for discounts. Lots of stores are still offering sales on summer items as they begin to fill the shelves with winter tools. This is the time for look for discounts on seeds and some plants. You might also get good prices on lawn and gardening equipment. Plant bulbs for spring flowers. This is still a good time to plant bulbs for irises, tulips and crocuses. Plant bulbs while temperatures are still in the forties and fifties but before the ground freezes. Build a compost. You can use items like raked leaves and shredded twigs. Add mulch to your garden bed. A few inches of mulch will help moisture levels throughout the fall and winter and will help suppress weed growth. Fertilize your lawn. You may have put away your mower but grass is still growing under the soil. Phosphorus-rich fertilizer will help will help strengthen roots. Pack up the sprinkler system. It might be time to dry out your sprinkler system and store it to prevent winter damage. Check your soil. You may want to add fresh soil before winter. You can also do actual gardening. Some plants thrive in the cooler temperatures. Consider planting broccoli, cauliflower, cabbage and kale. You’ll just need to keep the snow off the crops and make sure the ground is not frozen for an extended period of time. 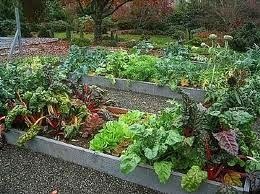 You should also consider getting rid of spring and summer plants that are no longer producing good vegetables. Some of what you do now will make for a greener garden once spring arrives.